Bryce Harper walks through the dugout at the Yankees' spring-training facility as fans lean over to try to get an autograph. TAMPA — Gabe Kapler, standing in the visiting dugout Wednesday night at Steinbrenner Field, noticed that a larger-than-normal crowd was gathered for his usual pregame media session. Phillies podcast: Mailbag time, Bryce Harper’s defense, how many wins to make the playoffs? “I was trying to figure out why everyone was here,” the manager cracked before a 5-5 Grapefruit League tie with the Yankees. A year ago, the Phillies were relatively anonymous. They were fresh off another losing season and it was Kapler — the new manager with the interesting blog and the affinity for numbers — who garnered the most attention. Expectations? Slim. A lot has since changed. The Phillies are again fresh off another losing season, but they spent 38 days of that losing season in first place. They then remodeled their roster with a busy offseason that ended by signing Harper to the richest contract in the history of American team sports. Expectations? They have returned for the first time in a while. “One of the things we've noticed in this camp is that the bar has been raised for us,” Kapler said. “Expectations have gotten higher, people expect more from us. The pack of New York reporters who greeted Kapler before the game was dwarfed by the group waiting for Harper to step outside the visiting clubhouse and talk about his night. Getting booed? He expected that, Harper said. Harper reached base on a catcher’s interference but went 0-for-2. So how’s his swing? As good as it could feel after six spring at-bats, he said. His schedule? 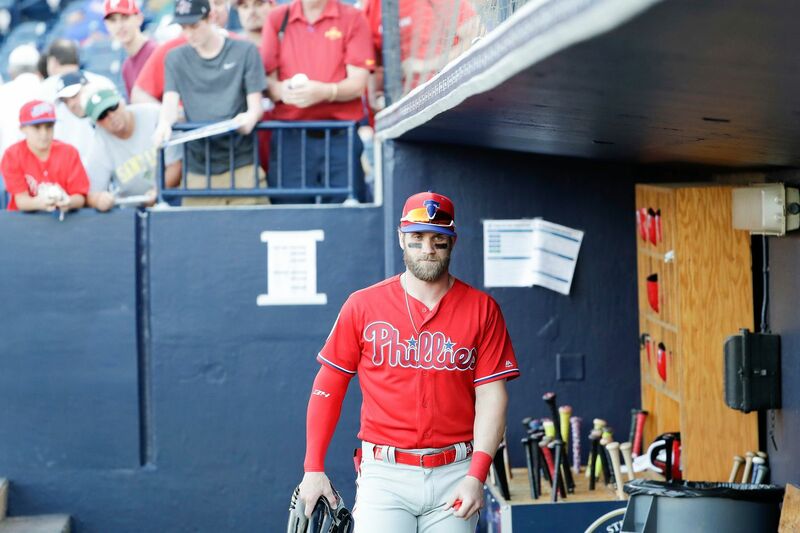 Harper plans to play in Clearwater on Friday, Saturday, and will be a designated hitter on Sunday. And how about the attention? How would Harper — who has lived his life in the public eye — advise his teammates who played last season for a team that battled for relevance? The size of a pregame session may be new to Kapler. Frequently playing on national television — two of the team’s first three games will be nationally televised — could be different for players who were with the team the last few seasons. And playing in front of packed crowds may take some getting used to. None of that attention will be new for Harper. He was on the cover of Sports Illustrated when he was 16. He was an All-Star when he was 19. He was an MVP when he was 22. Kapler, after the Phillies signed him, browsed YouTube to find old clips of Harper. He watched him win a teenage home-run derby. Even then, Kapler said, Harper was poised. Attention, for Harper, is the norm. He could not have appeared more comfortable when he opened the clubhouse door to see a large gathering of reporters. The attention, as always for Harper, will follow into the season. And the expectations? For him, that’s nothing new. Cesar Hernandez (hip flexor) and Odubel Herrera (hamstring) are both on track to be ready for opening day, Gabe Kapler said. Both played Wednesday in a minor-league game and are ready to rejoin the big club. Hernandez will start at second base Thursday and Herrera will be the designated hitter Saturday. … Drew Anderson will start Thursday in Port Charlotte against the Rays, while Jake Arrieta starts against the Pirates in Bradenton.